Bootie LA kicks off the Mardi Gras season with a decadent Mashquerade – dancing and partying all night long in masks, feathers, and beads. 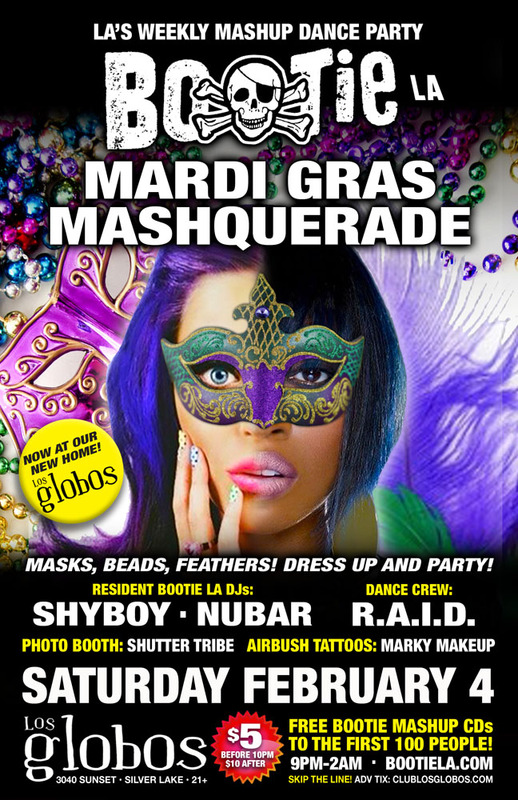 Dress up to party with us at Los Globos! Only $5 before 10 PM! Masks, beads, feathers! Dress up to party! Join us at Los Globos as we “laissez les bons temps rouler”! It’s Bootie LA’s Mardi Gras Mashquerade! We’ll have plenty of masks, feathers, and beads to get you in the Carnaval spirit! Dress to impress, or just show up in street clothes with your dancing shoes on — because resident DJs ShyBoy and Nubar will be throwing down mashquerade mashups to keep your moving! Plus resident dance crew R.A.I.D. keeps the Fat Tuesday spirit alive with their go-go insanity, Marky Makeup gives you airbrush tattoos with a touch of NOLA love, and Shutter Tribe will be there to capture you in all your Mardi Gras finery! All this, plus free Bootie mashup CDs for the first 100 people through the door!